A tabard is one of the simplest items of Medieval clothing you can make. While there are variations on the design, and you can make them as complicated as you like by making them part-coloured (split into two, four or more colours), in its most basic form, it is a long, narrow rectangle (or two sewn in the middle), with a keyhole neckline cut in the middle for your head. If you’ve been invited along to your first feast or re-enactment, a tabard is the quickest and easiest way to hide the fact that you’re just “trying it out”, and you haven’t got full kit. Groups like the SCA will welcome you to have a look, but might ask you to put on a tabard they lend out, over your “mundane” clothing. It’s what they call an acceptable minimum “attempt at pre-16th Century costume”. Lengths for tabards vary, from 3/4 length during the most famous Crusader period, to knee length, up to mid-thigh length in the 14th-15th Centuries. Longer styles could be split up the middle, usually to crotch height, to account for someone riding a horse regularly. Some were slightly more fitted, or the front and back was more of a large trapezium, than a rectangle. Sometimes there were additional panels at the shoulders, to show more heraldry, or colours. If you are making a tabard for a specific period, it’s a good idea to research a few pictures first. • Note the length. Does it fall to the floor, to mid-calf, knee or mid-thigh? • Consider how it was made. Can you see any seams? Can you see if it was lined with another colour or fabric? • Does it fall in a straight, vertical band from the line of the shoulders? Or does it flow more, with a fuller “skirt” from the belt? This latter style is trapezoidal, and it will affect the finished look, and the authenticity of your costume. • If you’re not simply trying to hide modern clothing for your first feast or re-enactment, make sure that your choice of style matches the styles of the period costume you are making to go underneath. Try not to mix in something you think “looks right” if it’s from another date entirely. To measure up your tabard, first, choose your length. • Measure from the centre of the shoulder, down the back, following the curve of the spine, to where you want it to end. • Measure across the shoulders, from tip-to-tip. Look at your source picture and decide if it needs to sit narrower or wider than this on the body, and adjust accordingly. Add 2cm for seam allowance. • If you want it to be parti-coloured, split your pieces in halves or quarters, and remember to add 1cm to the inside seams of each piece! If you’re still stuck, or if you’re running a workshop to get your group started, please download my PATTERN SHEET to print out and add measurements to the diagrams. It’s only $1, and helps to keep this site running. All I ask is that you don’t remove any of the credits from my work, or claim it as your own. The easiest thing to do is to sew the front half to the back half at the shoulders. You might like to use a “French Seam” to make sure the ends are completely enclosed, or you can simply overlock or zig-zag the raw edges to stop fraying. If you are making the front and back panels out of two or four pieces (parti-coloured), remember to sew these together before you do the shoulders. Start with all the vertical seams, and then do all the horizontal ones, and it will sit neat and fairly flat. Remember to leave your front and back splits in for horse riding if the design calls for it. Single Layer: Once the whole thing has been sewn together, use a rolled hem to finish all the outside edges on a single-layer tabard. Lined: If you are lining it, take your complete inside and outside pieces, and sew them together with the right sides facing. (Leave the neck hole open so you can turn the two layers right side out through this seam. If you sew even a little bit of the neck hole before turning, you’ll have to unpick it because it won’t work!). Turn and press your seams before finishing the neck hole. use bias binding turned right inside (so none is visible) for a neat, flat finish. Machine it to the outside before clipping your curves to the stitch line (essential either way), turn it inside, press, and then hand stitch the other folded edge of the bias down. You can machine it, but the finish won’t look period. If you have a heraldic device, or need a cross (e.g. 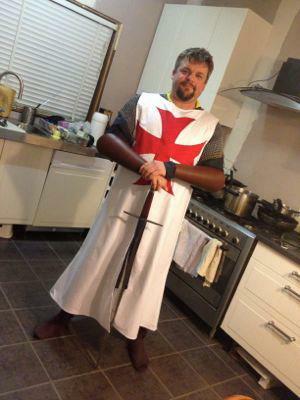 for a Crusader), the easiest thing is to appliqué it on. Transfer the design onto fabric in the right colour and size, and then use an iron-on adhesive paper like Vliesofix to back it, before cutting out the shape, removing the paper, and ironing to the face of your garment. The edges need to be stitched down or the appliqué will not survive the wash very well, and edges will fray. You can use machine zig-zag, hand stitching, or add extra zing with a coloured cord or braid sewn around the edges. More details (e.g. animals) can be added with stitch or fabric paint. Either technique was used in period! We'd like to see your tabards! We want to see your beautiful creations! If you've made something from this page, and you're proud of it, share it! Any style, any period, and especially with heraldic designs. Do you have a fabulous historical creation to share? Post it here and inspire our readers to create! Your story will appear on a Web page exactly the way you enter it here. You can wrap a word in square brackets to make it appear bold. For example [my story] would show as my story on the Web page containing your story. Please include at least one photo of your finished costume. TIP: Since most people scan Web pages, include your best thoughts in your first paragraph. We'd love to know where and when your costume is from, and even see a picture of the original source painting if you have it! Got pictures of your costume and your source artwork? Click the button and find the first one on your computer. Select it and click on the button to choose it. You could include pics of details, like the embroidery, headwear and funky sleeves.